Travel with Gunther Tours to Celebrate the 50th Anniversary of the Apollo 11 Mission! Apollo 11 was the spaceflight that landed the first two humans on the Moon. Mission commander Neil Armstrong and pilot Buzz Aldrin, both American, landed the lunar module Eagle on July 20, 1969, at 20:18 UTC. Armstrong became the first to step onto the lunar surface six hours after landing on July 21 at 02:56:15. Don't miss this special celebration! 50th Anniversary Apollo 11 Mission! Welcome Aboard! 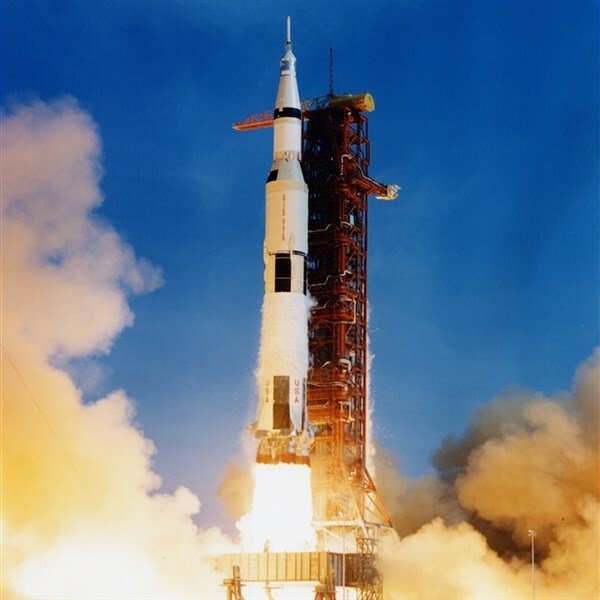 Join Gunther Tours for a fun-filled motor coach get-away in Northwestern Ohio celebrating the 50th Anniversary of the Apollo 11 Mission! After checking into our hotel for the next two nights, we go out for dinner and entertainment at Moon City Music. You will enjoy an "Over the Moon" experience all in one location . . . entertainment, meal, history and more! Following a delicious buffet dinner, New Outlook will entertain us. You will "Be Over the Moon" when you hear this award-winning duo perform familiar tunes such as "Bad Moon Arising", "Fly Me to the Moon", "Moon River", "Dancing in the Moonlight", "Blue Moon" and more. Later we return to our hotel for a restful night's sleep. After breakfast, we meet our step-on guide, and depart for a day of sightseeing. We begin with a tour through Wapakoneta, Ohio, Neil Armstrong's hometown. Hear tales about a young Mr. Armstrong and see his boyhood home, his high school and the former drug store where he worked to earn money to pay for his flying lessons. Learn about the community and the work ethic that led to his success in life. Enjoy a stop at St. Paul United Church of Christ where he used to attend church and meet an acquaintance of the Armstrong family who was the first director of the Neil Armstrong museum. An organist will play a selection of Neil's favorite hymns, followed by light refreshments. 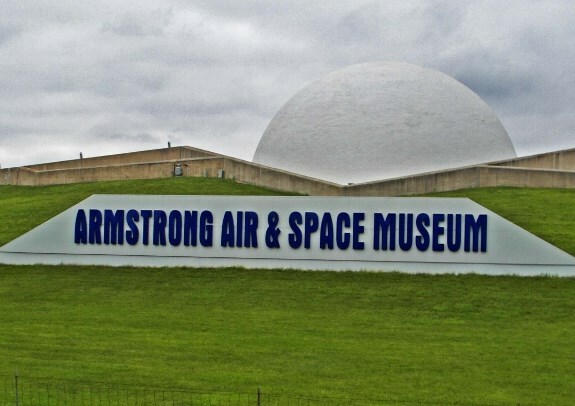 Next, we tour the Armstrong Air and Space Museum. This is no static museum; it is filled with motion and sound. There are seven interactive exhibits, ten audio/visual elements, and three simulators. You can practice landing the lunar module and space shuttle, or docking the Gemini capsule, as Neil Armstrong did in 1966. You will find the experience of piloting the simulators both challenging and entertaining. In the center of the museum is a 56-foot dome that houses the Astro Theater, a unique venue that allows you to enjoy the night sky or watch the 25-minute documentary about Apollo 11's lunar landing. There is no additional charge for access to either the simulators or theater. You will receive a commemorative pin and bookmark. Next, enjoy a buffet lunch of foods that were served on the first moon mission at the VFW in Wapakoneta. A guest speaker will talk about all the fascinating intricacies that went into their dietary planning. You will receive a complimentary menu from the Apollo 11 mission and American Flags. Our touring continues with a visit to Niekamp Farm Market in St. Henry, Ohio. At this unique country market, you will find a wide variety of Amish gift ideas, bulk foods, a selection of wines and beer and much more. Next, we visit Versailles Winery for a tasting and learn what wine was popular during 1969 and what wine they may have been drinking during the moon landing. Before returning to our hotel in Wapakoneta, we are treated to a delicious dinner at Bella's Italian Grille in Celina, Ohio. After breakfast we depart for the Airstream Factory in Jackson Center, Ohio. The Apollo 11 Astronauts spent several days in NASA's Mobile Quarantine facility when they returned from the moon, which was a converted airstream travel trailer. 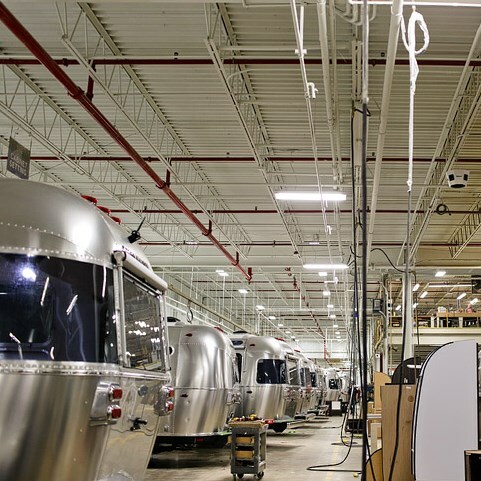 Tour the factory and see these iconic travel trailers being built. Following our tour, settle back, relax and enjoy the scenery on our drive down to Dayton, Ohio. Upon our arrival, enjoy a picnic style lunch at the Engineers Club, overlooking the Great Miami River in downtown Dayton. After lunch, it's a short drive to the Air Force Museum for a guided tour. 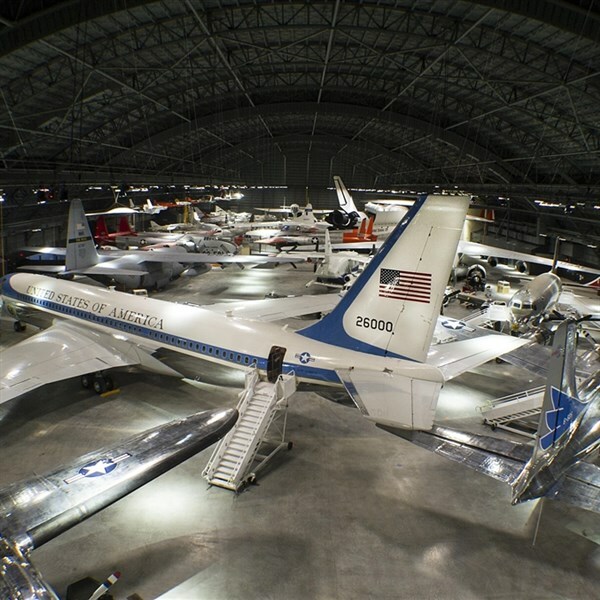 Our tour will include the opportunity to view a historic collection of presidential aircraft, and walk through four of them, including aircraft used by Presidents Roosevelt, Truman, Eisenhower as well as the Boeing VC-137C also known as SAM (Special Air Mission) 26000, which was used by eight presidents, including Kennedy, Johnson, Nixon, Ford, Carter, Reagan, George H.W. Bush and Clinton. Also, you will see the Memphis Belle, one of the most recognizable symbols of World War II. The new exhibit surrounding the Memphis Belle will include interactive displays, rare archival film footage and many personal artifacts that have never been seen before by visitors. Later we continue to our overnight accommodations at the Drury Inn in Franklin, Ohio. You will have time to relax and freshen up before going out for "Neil Armstrong: Lebanon, Ohio Neighbor for 23 Years" at the Historic Golden Lamb Inn in Lebanon, Ohio. You will enjoy a delicious three-course meal and Golden Lamb Historian John Zimkus will talk about one of Lebanon's best neighbors, Neil Armstrong, and his strong connection to the area. After breakfast settle back and enjoy the movie "Apollo 11" on our drive home, while reminiscing about our get-away celebrating NASA's heroic "Apollo 11" mission to the moon, and the bravery of Neil Armstrong and Buzz Aldrin, the first two humans to land on the moon and walk on the lunar surface. A lunch stop will be made en route home at a perennial favorite of Gunther Tours travelers, and no it's not a Cracker Barrel restaurant!